This article is about a piecewise constant function. For the unit step function, see Heaviside step function. In mathematics, a function on the real numbers is called a step function (or staircase function) if it can be written as a finite linear combination of indicator functions of intervals. Informally speaking, a step function is a piecewise constant function having only finitely many pieces. The Heaviside step function is an often-used step function. which is −1 for negative numbers and +1 for positive numbers, and is the simplest non-constant step function. ). It is the mathematical concept behind some test signals, such as those used to determine the step response of a dynamical system. The rectangular function, the next simplest step function. 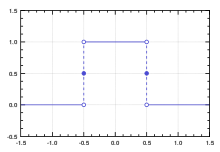 The rectangular function, the normalized boxcar function, is used to model a unit pulse. The integer part function is not a step function according to the definition of this article, since it has an infinite number of intervals. However, some authors also define step functions with an infinite number of intervals. The sum and product of two step functions is again a step function. The product of a step function with a number is also a step function. As such, the step functions form an algebra over the real numbers. The definite integral of a step function is a piecewise linear function. have finite length. In fact, this equality (viewed as a definition) can be the first step in constructing the Lebesgue integral. A discrete random variable is defined as a random variable whose cumulative distribution function is piecewise constant. ^ Weir, Alan J. "3". Lebesgue integration and measure. Cambridge University Press, 1973. ISBN 0-521-09751-7. ^ Bertsekas, Dimitri P. (2002). Introduction to Probability. Tsitsiklis, John N., Τσιτσικλής, Γιάννης Ν. Belmont, Mass. : Athena Scientific. ISBN 188652940X. OCLC 51441829.